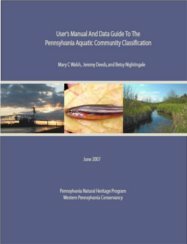 The Pennsylvania Aquatic Community Classification (ACC) project describes patterns in aquatic biodiversity to help conservation activities and aquatic resource management in the region. 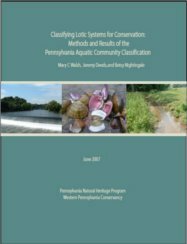 In order to address the threats faced by our region’s flowing waters, the ACC was designed to systematically identify stream community and habitat types for the freshwater mussels, macroinvertebrates and fish that live in Pennsylvania’s streams. This information provides a baseline for conserving flowing water systems and can be used to help assess the status of streams and rivers, prioritize high quality aquatic habitats for preservation, and select low quality habitats for restoration. The project findings have been divided into two separate reports, and are both available for download.